Each year, California employers are faced with the task of keeping up with a whole new round of labor laws and regulations, most of them courtesy of the state legislature. This year is no exception, with many changes occurring midyear. Staying up to date and ensuring compliance with these ever-changing state, local, and federal laws is an ongoing and serious responsibility for employers and HR professionals. Fortunately, there is help. This article discusses some of the more significant employment law changes over the past several months, many with an effective date of July 1, 2017. They include mandatory notices, new criminal background regulations, transgender rights, minimum wage increases, and wage and hour rights for farm workers. Last year, Assembly Bill 2337 (AB 2337) amended the Domestic Violence Employment Leave Act and created a new written notice requirement for California employers. Under the Act, an employer with 25 or more employees is prohibited from discharging, discriminating, or retaliating against employees who are victims of domestic violence, sexual assault, or stalking that take time off from work to seek medical attention, obtain victim services or counseling, or to participate in safety planning. With the enactment of AB 2337, employers have the new responsibility of providing written notice to new employees, and to current employees upon request, of their rights under the law. Employers were not required to provide written notification to employees until the Labor Commissioner developed and released a model notice. In early July, the new notice “Rights of Victims of Domestic Violence, Sexual Assault and Stalking,” was released in English and Spanish. Covered employers should begin using the notice immediately and distribute it to all new hires and current employees (upon request). To ensure distribution to newly hired employees, be sure to include the new notice in your company’s new hire packet. The California Fair Employment and Housing Council (FEHC) recently finalized new regulations that limit an employer’s ability to use criminal history when making employment decisions. The regulations are largely framed after the Equal Employment Opportunity Commission’s (EEOC) 2012 guidance on criminal background checks, and apply to California employers with five or more employees, effective July 1, 2017. Under the new rules, any criminal background check policy that has an adverse impact on a protected class (race, gender, national origin, etc.) will be deemed unlawful unless the employer can show the policy is job-related and consistent with business necessity. Conduct an individualized assessment of the circumstances and qualifications of the applicants or employees excluded by the conviction screen. Notice requirement of adverse action. Regardless of the method used to justify the employer’s background check policy, before any adverse action may be taken the employer must give the applicant or employee an individual notice of the disqualifying conviction and a reasonable opportunity to present evidence that the information is factually inaccurate. If the individual establishes that the record is incorrect, then the conviction record cannot be considered in the employment decision. Note, however, that an employer who successfully demonstrates its policy of considering conviction history is job-related and consistent with business necessity may still face a challenge. Under the new rules, an adversely impacted individual can still prevail if he or she can demonstrate that there is a less discriminatory alternative that serves the employer’s goals as effectively as the challenged policy, such as a more narrowly targeted list of convictions or another form of inquiry that evaluates job qualification or risk as accurately without significantly increasing the cost or burden on the employer. In light of the n ew rules and the significant risk to businesses that conduct criminal background checks, employers should review their policies to ensure they achieve full compliance with the FEHC’s regulations. Ban-the-Box legislation pending. Employers should also keep an eye on pending Ban the Box legislation. Limitations on background checks could be expanded even further under Ban the Box legislation (AB 1008) that is currently pending in the state senate. This bill mirrors the ordinance adopted by the city of Los Angeles and would limit an employer’s ability to consider criminal history information about a job applicant until after a conditional offer of employment has been made. AB 1008, which is currently in the Senate Appropriations Committee, applies to employers with five or more employees. Whether this bill makes it to the Governor’s desk and is signed into law is yet to be seen. However, September 15 is the date that all bills passed by the state legislature must be sent to Governor Brown for his signature or veto. October 15 is the last day for Governor to sign or veto bills passed by the legislature. To ensure appropriate working conditions, employers may make reasonable, confidential inquiries of employees for the sole purpose of ensuring access to comparable, safe, and adequate multiuser facilities. The Transgender Work Opportunity Act (SB 396). Another piece of pending legislation (SB 396) amends the California Fair Employment and Housing Act (FEHA) and requires employers with 50 or more employees to include, as a component of the currently required sexual harassment training and education for supervisors, harassment training based on gender identity, gender expression, and sexual orientation. The bill would also require employers to display a poster regarding transgender rights in a prominent and accessible location in the workplace. This bill is pending in the Senate Appropriations Committee. Earlier this year, the statewide minimum wage rate increased to $10.50 per hour for employers with 26 or more employees. For smaller businesses with fewer than 26 employees, the minimum wage increased to $10.00 per hour. Senate Bill 3, signed into law last year, will increase California’s minimum hourly wage each year until 2023, when it reaches $15 per hour. Emeryville: For employers with 56 or more employees the rate increased to $15.20 per hour and for 55 or fewer employees the rate increased to $14.00 per hour. Los Angeles: For employers with 25 or more employees $12.00 per hour and for 25 or fewer employees $10.50 per hour. Santa Monica: For employers with 26 or more employees $12.00 per hour and for 25 or fewer employees $10.50 per hour. El Cerrito: The rate increased to $12.25 per hour. San Francisco: The rate increased to $14.00 per hour. Pasadena: The rate increased to $12.00 per hour. Employers that employ farm workers likely are already aware of AB1066—new legislation that will have a major effect on wage and hour requirements over the next several years. The Phase-In Overtime for Agricultural Workers Act of 2016 (AB1066) creates new overtime rights for agricultural employees under state law. The Act removes the previous exemption for agricultural employees regarding hours, meal breaks, and other working conditions (effective as of January 1, 2017,) and creates a schedule that phases in overtime requirements for agricultural workers over the course of 4 years from 2019 to 2022. The law provides employers that employ 25 or fewer employees an additional 3 years to comply with the phasing in of these overtime requirements. Under the agricultural overtime law, farm workers in California currently may not be employed more than 10 hours in a workday or more than 6 days in any workweek, unless they are paid 1-1/2 times their regular rate of pay for hours in excess of 10 in any workday and for the first 8 hours on the 7th day of work and double the employee’s regular rate of pay for all hours worked over 8 on the 7th day of work in the workweek (IWC Wage Order 14). Effective as of January 1, 2017: A day of rest must be provided to any person employed in an agricultural occupation effective January 1, 2017. In addition, meal periods must be provided effective January 1, 2017. Employees must be allowed a half-hour meal break during any work period of more than 5 hours per day. Employees may voluntarily give up their meal breaks if the workday does not exceed 6 hours. Employees who work more than 10 hours per day must be provided a second meal period of not less than 30 minutes, except that if the total hours worked is less than 12 hours, the second meal period may be waived, but only if the first meal period was not waived. Beginning January 1, 2019: For an employer that employs more than 25 employees, any person employed in an agricultural occupation must be paid 1½ times his or her regular rate of pay for working more than 9 ½ hours in any 1 workday or more than 55 hours in any 1 workweek. For employers with 25 or fewer employees, the effective date is January 1, 2022. Beginning January 1, 2020: For an employer that employs more than 25 employees, any person employed in an agricultural occupation must be paid 1½ times his or her regular rate of pay for working more than 9 hours in any 1 workday or working in excess of 50 hours in any 1 workweek. For employers with 25 or fewer employees, the effective date is January 1, 2023. Beginning January 1, 2021: For an employer that employs more than 25 employees, any person employed in an agricultural occupation must be paid 1½ times his or her regular rate of pay for working more than 8 ½ hours in any 1 workday or more than 45 hours in any 1 workweek. For employers with 25 or fewer employees, the effective date is January 1, 2024. Beginning January 1, 2022: For an employer that employs more than 25 employees, any person employed in an agricultural occupation must be paid 1½ times his or her regular rate of pay for working more than 8 hours in any 1 workday or more than 40 hours in any 1 workweek. For employers with 25 or fewer employees, the effective date is January 1, 2025. Beginning January 1, 2022: For employers that employ more than 25 employees, any person employed in an agricultural occupation must be paid double time for working more than 12 hours in 1 day. For employers with 25 or fewer employees, the effective date is January 1, 2025. In addition, the new law states that the California Department of Industrial Relations (DIR) is responsible for updating Wage Order 14 so that it is consistent with the provisions of AB 1066. Although the DIR recently updated most of the Wage Orders, it has not yet updated Wage Orders 14 and 17. 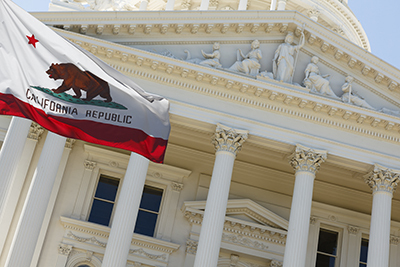 It is expected that further guidance regarding AB 1066 will become available in the future when the state agency issues the redrafted Wage Order 14. Other bills pending in the legislature include new parental leave, new workplace retaliation procedures and injunctive relief, a higher overtime salary threshold, and a ban on salary history inquiries. We will know if these and other pending employment-related bills make to the Governor’s desk no later than September 15. Stay tuned! Want to learn more about these trends and topics? 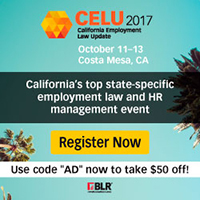 Attend the 12th annual California Employment Law Update (CELU) being held October 11-13, in Costa Mesa, California. You’ll hear from local attorneys who will be covering a variety of topics including: the California Family Rights Act, workplace bullying, gender expression, and more! Click here to learn more, or to register today.